Natural fruit pectin works best for gelling jelly and jam when you have plenty of acid and plenty of sugar. 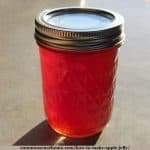 Tart fruit and less ripe fruit has more pectin than very ripe fruit, so to help your apple jelly gel more quickly, be sure to include some less ripe apples in the mix. To juice your apples: Wash apples. Remove stems, damaged areas and blossom ends, cut into quarters or slices. Don't peel the apples – much of the pectin is in the peel. Place apples in a non-reactive heavy bottom stockpot (stainless steel or enamel). Add enough water to half cover apples. Cook until fruit is soft, stirring occasionally to avoid burning and promote even cooking. To strain the apple juice: Place well-cooked apples into a jelly bag strainer or flour sack towel in a colander. If using a towel, gather ends of the towel and hang it from an elevated location. I hang mine from my kitchen cabinet handles because my cabinets are sturdy. If you have lighter cabinets, hang from the back of a chair or other solid location. You can see my setup in the currant jelly post. If you want a clear jelly, don't squeeze the bag to hurry it along – just let it drip. If you like, you can cook your apples one day, let them drain overnight, and make apple jelly the next day. Measure juice and sweetener into pan. Mix well. Make sure to use a large pot, as the jelly will boil up and foam a great deal during cooking. This is an 8 quart stockpot, and at times the jelly reached close to the rim. Cooking sugar and apple juice to make apple jelly. Cook at a high boil, stirring constantly, until the gelling point is reached (220°F (104 °C)). When the gelling point is reached, the apple jelly will sheet cleanly off a spoon. Alternatively, you can place a spoonful of jelly on a cold plate, stick it in the fridge for a minute, and then run your finger through it. 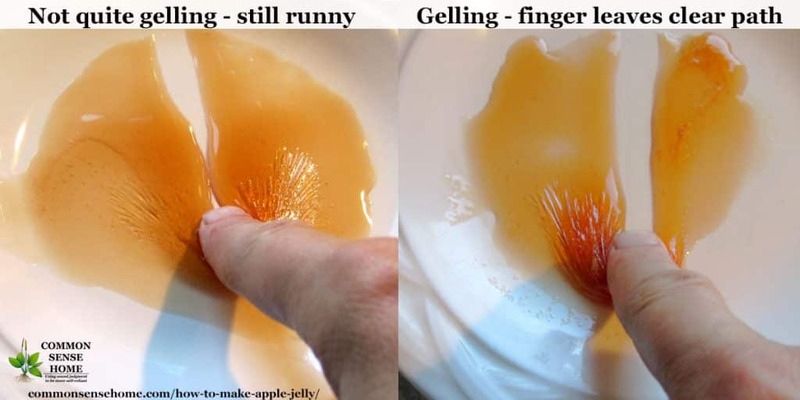 Jelly that has jelled should hold the shape of the finger trail for a bit, not run right back together. Smaller batches work better than larger batches. I ended up with around 10 cups of juice, so I made a larger batch. It took over an hour to boil down to jelly. Smaller batches cook much faster. While the jelly is cooking, sterilize seven 8-ounce jars, keep hot. Heat lids and rings in hot water, keep warm but not boiling. Fill water bath canner and bring to boil. Ladle jelly into sterilized jars leaving 1/4″ headspace. Wipe rims clean and screw on the lids. Process for 10 minutes in water bath canner (add 1 minute for every 1,000 feet above sea level). Makes roughly 5 cups of apple jelly for every 6 cups of apple juice. With 10 cups of crabapple juice and 5 cups of honey I ended up with 8 jars of jelly. The red skinned crabapples gave it a very pretty red color. This simple jelly is a great way to use up small or damaged apples to make a delicious treat. Wash apples. Remove stems, damaged areas and blossom ends, cut into quarters or slices. Don’t peel the apples – much of the pectin is in the peel. Place apples in a non-reactive heavy bottom stockpot (stainless steel or enamel). Add enough water to half cover apples. Cook until fruit is soft, stirring occasionally to avoid burning and promote even cooking. Place well-cooked apples into a jelly bag strainer or flour sack towel in a colander. If using a towel, gather ends of the towel and hang it from an elevated location. Measure out your juice and sugar. Cooking and canning the apple jelly. Place juice and sweetener into pan. Mix well. Make sure to use a large pot, as the jelly will boil up and foam a great deal during cooking. Cook at a high boil, stirring constantly, until the gelling point is reached (220°F (104 °C)). While the jelly is cooking, sterilize seven 8-ounce jars, keep hot. Prep two piece canning lids. Fill water bath canner and bring to boil. Ladle jelly into sterilized jars leaving 1/4″ headspace. Wipe rims clean and screw on the lids. Process the apple jelly for 10 minutes in water bath canner (add 1 minute for every 1,000 feet above sea level). Makes roughly 5 cups of apple jelly for every 6 cups of juice. Once jars have cooled, remove rings, date and label jars. Store in a cool, dark location out of direct sunlight. Use within 18 months for best quality. If you want a clear jelly, don’t squeeze the bag when making juice to hurry it along – just let it drip. Can I start with Apple Juice to Make Jelly? Yes, you should be able to make apple jelly from commercial apple juice. Most commercial apple juice is quite sweet, so it may take a little longer to gel than juice that includes less ripe apples. Do I Need to Can the Apple Jelly? Nope. If you'd like to cook up a small batch of apple jelly and keep it in the refrigerator instead, that's fine. The high sugar content will keep it shelf stable at room temperature for some time, but refrigeration is safer for longer storage if you don't can the jelly. This year we had a ton of crabapples gifted to us from a neighbor. I canned 14 quarts whole as honey-cinnamon crabapples, made some into applesauce and used some for both juice and sauce. It was nice to get two end products out of the same batch of apples. I cooked the apples up one night and made the jelly the next day so the juice had time to drain. After draining the apples for apple jelly, I ran them through our food strainer to make applesauce. This gave us a nice, thick sauce that would be great for fruit leather since much of the liquid was already removed. 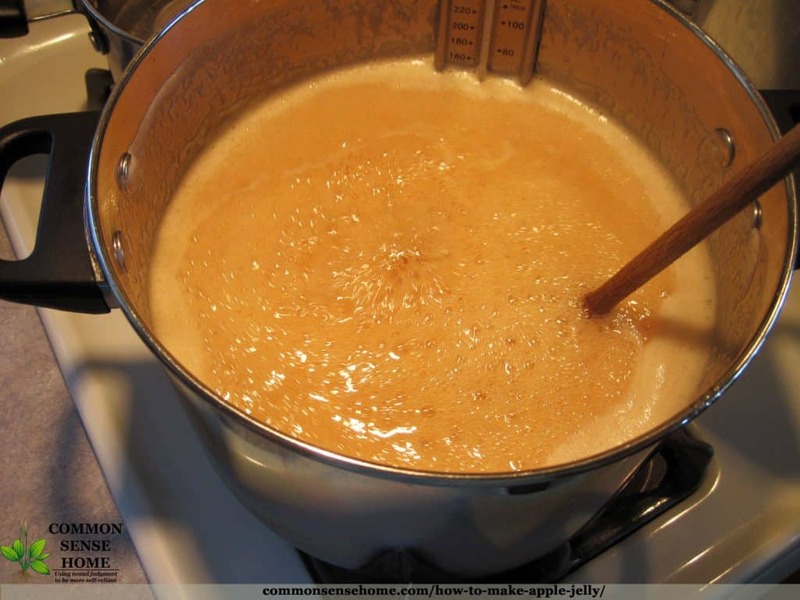 You can read more about making applesauce and other apple treats in the post, “Preserving Apples – How to Make Applesauce, Apple leather and Dried Apple Slices“. Apple scrap vinegar is another great way to use peels and odds bits. We also have a recipe for making hard cider, and apple cider drink recipes. Originally posted in 2013, updated 2015, 2018. Quick question and I know it goes against the homemade. But if I were short on time, could I use apple juice from the start? I haven’t tried it, but it should work, as I’m sure they don’t peel the apples before juicing commercially. 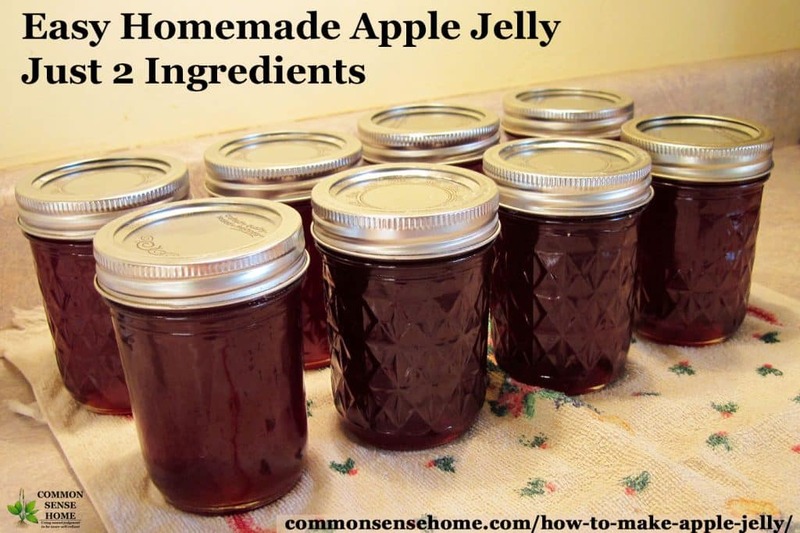 The first time i made jelly, I used store bought frozen apple juice and honey. It jelled perfectly. I had no idea what I was doing. I just got a recipe, replaced the sugar with honey and the juice from cooked apples with the store-bought juice i reconstituted in a pitcher. No candy thermometer, no pectin, no canner I packed it into used (but clean) jelly jars from store-bought jelly, and it is a wonder I did not poison my friends. Hey my problem with jars is my wife is so proud of my jelly making she just has to give the jelly to friends and family. So much for keeping the jars. Maybe put a tag on them indicating that they should return the jars for refilling? Many don’t realize that they get reused, but I’ve trained friends and family to return mine. Yes you can use apple juice, orange juice and it works i’ve done it. It might not have enough pectin in it and it would never jell. If you got your juice and sugar to 220 Fahrenheit and let it boil for about 3 mins at that temp it won’t need pectin. So if your jelly has not set open the jars and put them back in the pan and reboil what you have. Get another box of pectin and when your new jelly gets a hard boil (218-220) let it boil for 1 min and remove from stove. Do the apples have to be blemish free? Not at all. This is a good use for apples that are a little bit ugly – just make sure to cut out anything rotten. could i use a juicer to process the apples and then go to the cooking up step? The cooking process helps release the pectin from the apples, so I don’t think raw juice would work as well. I juiced my apples and tried it; it didn’t work. ‘CommonSenseIdea’ is correct, it needs the cooking to get the pectin. I now have jars and jars of apple syrup! After reading this, I made the jelly as directed, and it was great! I also looked up making and jarring pectin from apples, so I can have home made pectin on hand for other recipes. Youtube has some good tutorials on that subject. How long does the apple jelly keep in the jars? Once it has been processed, easily a year or more. If you were to just stick it in the fridge, a few weeks. Do you have to use that much honey or sugar? Can you make it with less? Or even none? To make a simple two ingredient jelly, sugar is required. If you want to do a low or now sugar jelly, you’ll have to add special pectin or another jelling agent. For different recipe options, you can check out the article “Jellied Products Without Added Sugar“. I want to thank you for the recipe. I peeled three bags of apples and I am using just the peels and the cores for my jelly, I have never tried this before, will it have enough pectic in it to make the jelly? I use the apples for apple butter. The pectin is generally more concentrated in the peels, but I’m not sure how you’re making jelly out of just peels and cores. I just boil them and then strain the juice out like you would the apples. But I pressure cooked it when I was done. I am not sure if it is going to set up or not. It was still runny this morning. This was the first time I tried it like this, but read that someone had did this before. I suspect that the added water would interfere with jelling. With a cooked jelly like this with no added pectin, odds are if it didn’t gel when you were cooking it, it’s not going to gel later – but there’s always apple syrup. I used just peels and cores to make my jelly and it turned out fine. I may have boiled it a little too long as the consistency is a little thicker than most jellies, but it tastes great! Try including some greener apples in your mix for more pectin, or cooking it longer. If you used a commercial apple cider, it’s possible that it was processed with a pectin reducing enzyme, since many people don’t like a more cloudy drink (which comes with more pectin). My apples are from my apple tree, I’ve been following this recipes for over a week now ( had to wait for my local store to get more jars) but some of my apples are starting to get soft and the skin, wrinkly. Can I still use those apples? Cooking up soft, wrinkly apples for preserving is a great way to save them from the compost heap. 2 qt. or larger jars. I don’t understand why you go through the whole water bath canning thing if you pour boiling juice into hot, sterilized jars and immediately add the lids and finger tightened rings…? 10 minutes in a water bath canner is the recommended safe canning practice. With appropriate head space and time in the canner, all the air is driven out of the top of the jar, creating a vacuum. This adds another layer of safety to home food storage. I made this yesterday opened a jar today and it was like honey/gooey candy. What went wrong ? If the jelly was runny, odds are you didn’t cook it long enough (to the jelling state). You may recook, or use it like syrup or a very soft spread. 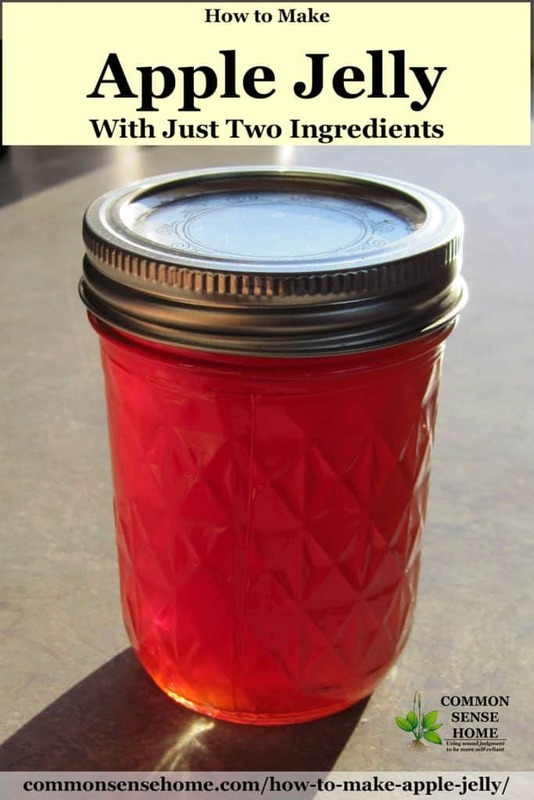 If it’s weeping (liquid separating from the jelly), this may be due to the use of beet sugar, which reacts differently in recipes than cane sugar. Its thick like cold honey. Going to cook it some more and try and turn it into a hard candy. Good luck. Be careful not to scorch it, which is easy to do once you get that hot. Do you use the apple leftovers after they’ve drained? (I’ve never made jelly before, only jam, so I’m not sure what would be left after draining–f it would be enough to, say, make applesauce or apple butter). Yes, if you’ll check the bottom of the post, I mentioned that I turned the drained apples into sauce. You could also cook them down more into apple butter. This looks delicious! Do you ever can apple juice? I have 2 tinies & would love an alternate to store bought juice. I haven’t because I haven’t had that enough to can, but it’s certainly possible. You pints and quarts should have 1/4 inch headspace, and be processed for 5 minutes in a boiling water bath canner. I made one batch according to the directions but found the honey flavor a little strong, so I cut the honey down to 1/3 cup honey per each cup of juice. I found the taste so much better. I used sweet apples. I am off to pick more apples. Oh, by the way, the Apple sauce from the remains is beyond yummy. Can I use guava necter instead of honey or sugar? Or a combination of the two? I have seen no references that provide information on using guava nectar as a sweetener for jelly that will be canned. It’s possible to can fruit juice, so I’m guessing you could can guava, but I would have no idea about what proportions to attempt to use in a jelly. Would it be OK to refrigerate it in a bowl if it is going to be eaten as soon as it is set? Can you use both honey and sugar? Yes. Keep in mind that honey is roughly twice as sweet as sugar. Thank you so much for this recipe! But like another comment said, mine turned into thick honey like stuff. It is good, but it is not jam. It kinda tastes like apple honey. I put my apples in Alan and covered them half-way with water. By the time they were done I could not get much juice. Can I add water and retook the apples? Did you mean to say that you put your apples in a pan? If you covered them halfway with water, there should be plenty of juice – unless you turned the heat too high and left the lid off. In the future, try low heat, a heavy bottom pan, and a lid to capture the steam and keep it in the cook pot. You could try adding water and recooking, but I’m not sure how it will work out. I suspect by this point the flavor will be very cooked, although the resulting jelly would still be likely to gel. You may want to run these apples through a chinois or food strainer and turn them into apple butter or apple sauce instead, since they are so low in juice. For years I have cooked my apples for chunky applesauce with skins on, removed the skins after cooking to run through the food mill, the rest goes into a colander to drain the water/juice which I then cook more apples in or, when it gets too thick, put in a pitcher to use as juice or pancake syrup. Never thought about making jelly with the juice water. Just tried my first batch! 4c. juice + 2 c. sugar = 3 jelly jars and enough in the pot for a slice of bread which we all shared and enjoyed! 2nd batch is currently in the canner. I may not have cooked it down as much since I had 3 (1/2 pt)+a baby jelly jar. Hopefully it will still be jelled. Thanks for the idea! With 4 totes of apples off my tree, I needed more ways to preserve the bounty! It jelled! Perhaps too much! Very difficult to spread. Perhaps I won’t cook it quite as long next time. Plenty of apple to experiment with! If it’s crazy thick, warming it up a little for meals (like to serve with pancakes) might be worth it. At least it works! Please someone tell me this. APPROXIMATELY how long does it take apple jelly to reach jelly stage. 10 minutes, 30 minutes, 2 hours ……..??????? What. I can find nooooooooo estimate. It depends on the pectin content of your apples and how big of a batch you are attempting to cook. Unlike commercial pectin, natural pectin amounts vary in every single batch. A small batch of jelly with high pectin apples will be ready much more quickly than a larger batch with more ripe apples. very happy with my first jelly making in many years and it turned out beautiful. I need a really good tasting apple butter recipe. Also a great apple sauce recipe. And I would like a nice tasting apple juice recipe. Thanks. Going to try making for the first time. Quarter and seed apples. Cook until soft. Run through a food mill or food strainer. Use as is or add sweetener of your choice to taste, and a splash of lemon for tartness if the apples are on already on the sweet side. Add some cinnamon, ginger, cardamom or other spices if you like. Place applesauce in a tea towel to drain off juice. (Now you have apple juice.) After most of the juice has drained off, put the sauce in a pot and cook down gently at low heat until it’s as thick as you like. Alternatively, you can also run fresh apples through a juicer or steamer juicer to make homemade apple juice. Or you can peel and quarter you apples and cook them down to softness in a heavy bottom pot or slow cooker without running them through a food mill. Any of the above can be canned in a boiling water bath canner with 1/4 inch headspace and 10 minutes processing time, or frozen. Thank you for these recipes. I will start on them in a few hours. Great recipe. Thank you. We used wild nova scotian apples. Got a beautiful bright pink jelly. Its delicious!! Odds are it’ll spread however long it was cooked, it may just be a little stiff. Just picked 20lbs of apples from our tree today with the kids and my gf made her famous apple crisp. I tried this recipe for apple jelly… I had 6 cups of juice and used 4 cups white and 2 cups brown sugar. I did the plate test and it passed but it is in the jars now and we will find out tomorrow if it will jell. With the leftover apples I put them through the magic bullet and made a kind of apple butter… will see how it is tomorrow. I put a small bowl of the jelly in the fridge and it has been an hour now, it is cooled but still kinda liquidy. I have to say it wasn’t clear on how long you have to boil the jelly…once it reached temp I did the plate test (1 min in fridge to cool). And I started making jars not long after. I have already made strawberry jam and I had to boil it for 10min….. I hope this works. Last year I made apple jelly from my crab apples. I did use pectin, but I tripled the batches from the directions on the ball insert. I hard boiled 3 minutes instead of 1 minute and canned it. It was syrup but after a few weeks it jelled in the jars and was perfect. I again did the same this year. I have many jars of syrup that I put into the pantry to ignore for a month hoping they jell on their own. It worked with my orange marmalade too. Have you heard of these pectin jellies getting hard while they sit in jars? I really hope it works this year. I haven’t read about it elsewhere, but I have had it happen myself with a batch of grape jelly back at our old place. I prefer glass, but if you want to do plastic and freeze what you don’t use right away, it should be okay. Just make sure the jelly has cooled enough that you don’t melt the plastic. Can I juice my apples using a juicer instead of cooking the apples? You can, but you should be aware that juicing the apples with a juicer won’t extract as much pectin from the skins as cooking the apples and straining them. This means that your apple jelly may be less likely to gel properly. If you decide to go ahead with it, scoop off the foam from juicing before making jelly, and strain the juice if you would like a clear jelly. Do you use the water from the pan after the apples have boiled as well as the juice you get from straining/hanging the cooked apples? Or do you only strain the cooked apples to get the juice, discarding the liquid in the pan after boiling the apples? Everything that was in the cook pot goes into the strainer/jelly.